Recently I've been very into the idea of time-based heatmaps as an easy way of understanding relative aggregates by date and time. I think it's important to view behavior by time as the numbers are often very different when looking across time intervals such as year, month, day of the week, hour etc. For example, US consumers shopping patterns typically ramp up during the October-December months with a drop off in January. Another example could be coffee shop orders by time of day. Intuitively, we expect the coffee sales to peak during the morning and early afternoon hours. So that covers the why I like time period analysis, but why do I like heatmaps? Well, heatmaps can pack in a dense amount of information into an information grid which will very quickly allow the user to identify relative patterns. For example, Looking at the raw data set below (left) does not have the same impact as looking at the equivalent heatmap (right). In terms of setting up the R working environment, we have a couple of options open to us. We can use something like R Studio for a local analytics on our personal computer. Or we can use a hosted, multi-language collaboration environment like Watson Studio. 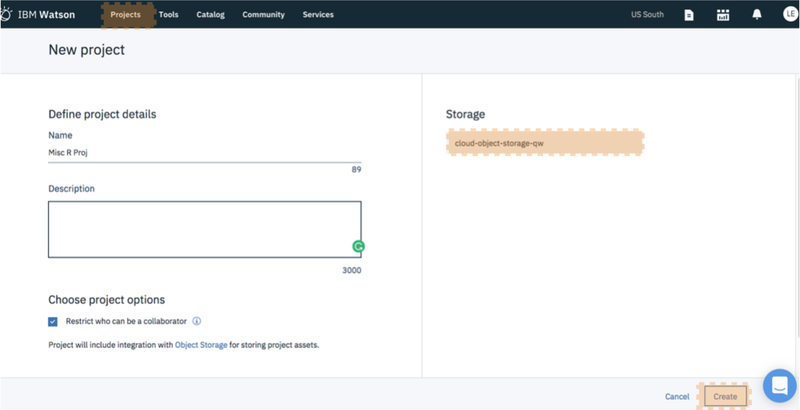 In this tutorial we are going to be using IBM Cloud Lite account and Watson Studio to host our data set and and run the R analysis. Note: the same R code can be run in any R environment. R packages contain a grouping of R data functions and code that can be used to perform your analysis. We need to install and load them in Watson Studio so that we can call upon them later. As per the previous tutorial, enter the following code into a new cell, highlight the cell and hit the "run cell" button. You may get a warning note that the package was installed into a particular directory as 'lib' is unspecified. This is completely fine. It still installs successfully and you will not have any problems loading it in the next step. After you successfully install all the packages, you may want to comment out the lines of code with a "#" in front of each line. This will help you to rerun all code at a later date without having to import in all packages again. As done previously, enter the following code into a new cell, highlight the cell and hit the "run cell" button. In this example we are going to load the data set right from the data.gov website. This will allow you to ensure that you get the latest data as it updates every four hours! We will then be assigning a few color variables that we will use to create the heatmaps. Note you don't need to supply your own color variables, but I like to try pretty new color combination. Finally, we are going to look at the data set and attach the column names so that we can reference columns by name vs by the full dataframe + name combination. Next, we need to prepare our dataset. Luckily, the source data has a nicely formatted timestamp field and we don't need to do much data wrangling. We can use the super handy lubridate package to gather time interval information such as month, year, week day, hour etc. We then will peek at the dataset and attach the column names. Next, we need to create a summary table which has all of the information we would like to display in the heatmap. In this case we would like to display the number of incidents by hour and day of the week. This is incredibly easy to do with the ddply function. We then need to reverse the order of the months factor so that they display nicely in the map. We will create the heatmap using our trusty ggplot2! Note that, to create the actual heatmap we only need the first three commands. Everything after scale_fill_gradient() is just formatting gravy to make the chart more aesthetically pleasing. Voila! We have our beautiful heatmap of incident totals by Day of Week and Hour using ggplot2! For heatmap 2 we are going to follow the same steps as above. The only differences is that we are now going to view by year and month. For heatmap 3 we are going to continue with a similar approach. The only differences is that we are now now going to bring in a non-time based variable into the heatmap. Thank you for exploring time based heatmaps with me! Please comment below if you enjoyed this blog, have questions, or would like to see something different in the future. Note that the full code is available on my github repo. If you have trouble downloading the file from github, go to the main page of the repo and select "Clone or Download" and then "Download Zip".